My knees tremble and my hands sweat as I carefully take one step at a time out into what feels like the open air. “Now I know what it feels like to take the first scary steps of a bungee jump or a parachute jump,” I think as I take another step trying to beath slowly and not panic. There is nothing but a thin see-through glass floor between my feet and the palm trees 300 meters further down. 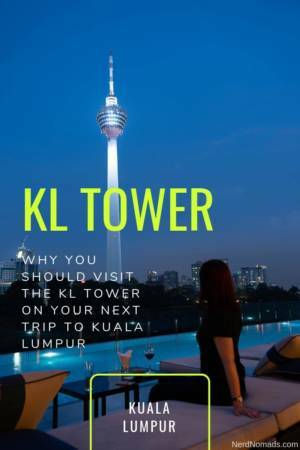 KL Tower is a telecommunication tower in the center of Kuala Lumpur, whose official name is Menara KL. 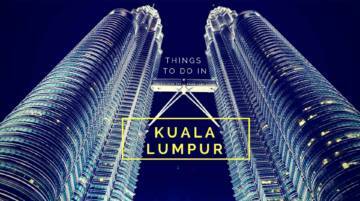 It has become one of the top sights of Kuala Lumpur and is a must-visit if you are going to KL. The KL Tower has become the symbol of KL, and you can spot it from all over the city as it is impressively 421 m tall. 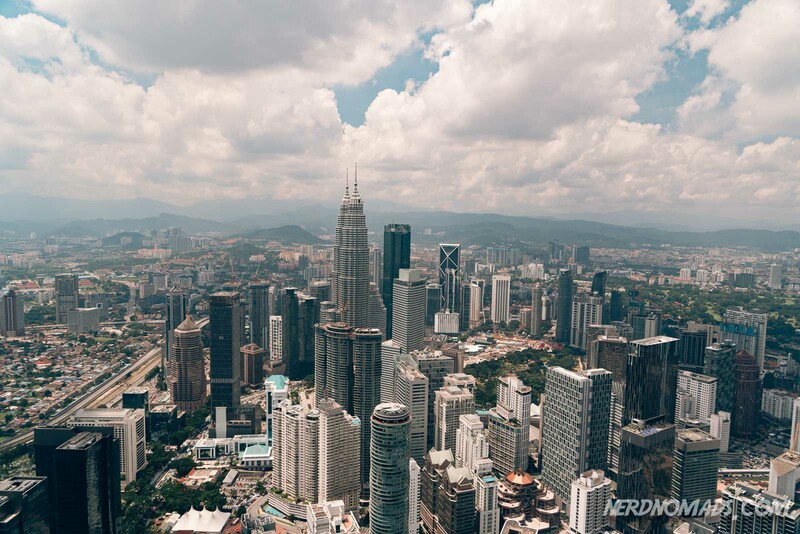 From the top, you will have the best view of the KL skyline! 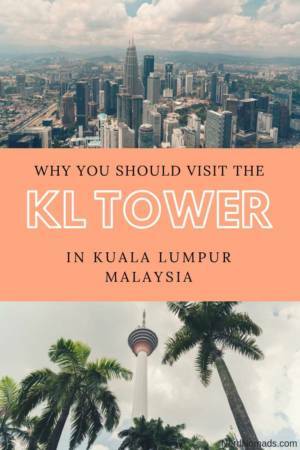 Although the famous Petronas Towers is a taller building (451,9 m tall), the KL Tower gives you a higher viewpoint as the hill Bukit Nanas that it’s built upon is 100 m above sea level. KL Tower has the record as the tallest freestanding tower in the whole of Southeast Asia, and the seventh tallest in the world where the tallest is Tokyo Skytree (634 m). 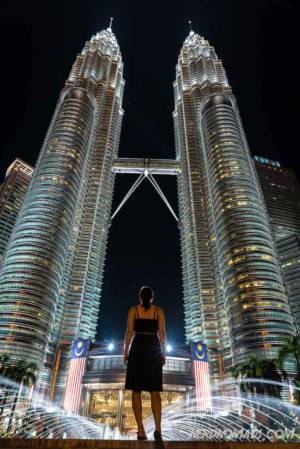 It took eleven years to build and was completed in 1995. 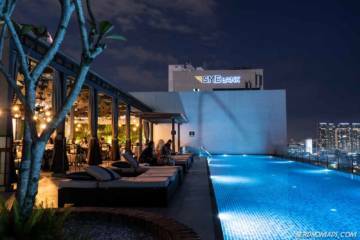 If you want to stay close to KL Tower, check out our guide on Where To Stay in KL. 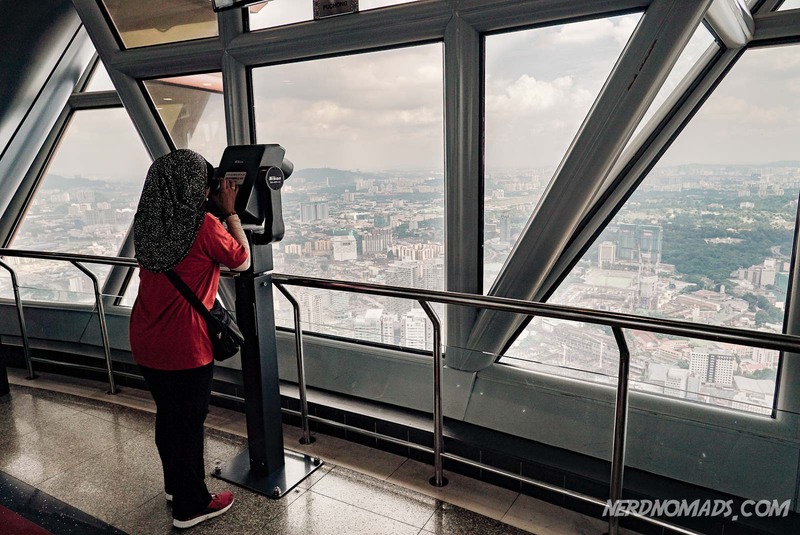 The Sky Deck is an open-air deck located 300 m above ground in KL Tower, and it is the highlight of KL Tower in our opinion. 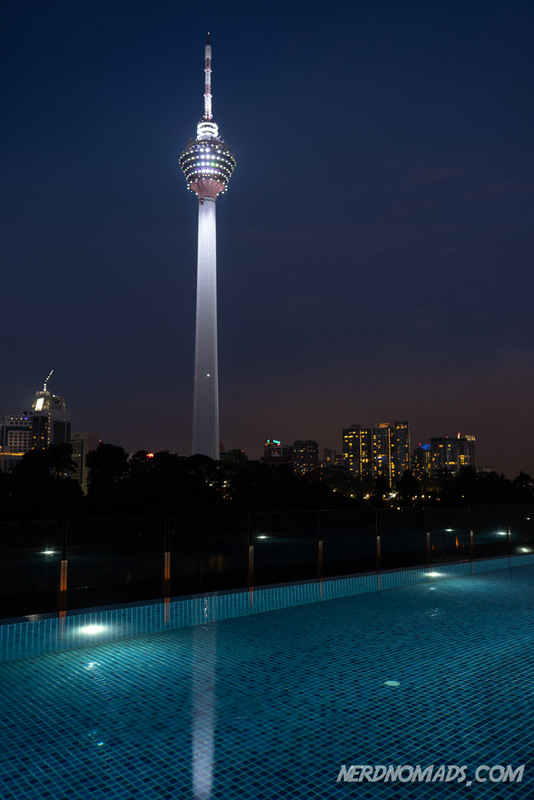 It is spectacular and has an excellent 360-degree view of KL! Here you will feel the wind in your hair and be able to take your photos and show-off Instagram shots without windows being in the way. The access to the Sky Deck is weather dependent, however, and it closes when there is a risk of lightning due to security reasons. So make sure to head to the KL Tower on a day when the weather is decent if you want to get up to the Sky Deck. Unfortunately, there is no announcement on their webpage about this, but you can call them and ask if the Sky Deck is open before heading there (we always do that if we plan to head there on a cloudy day with rain in the air). An extra cool and a bit scary feature of the Sky Deck is the Sky Box. There are two Sky Boxes on the Sky Deck, a glass box jutting out from the deck. 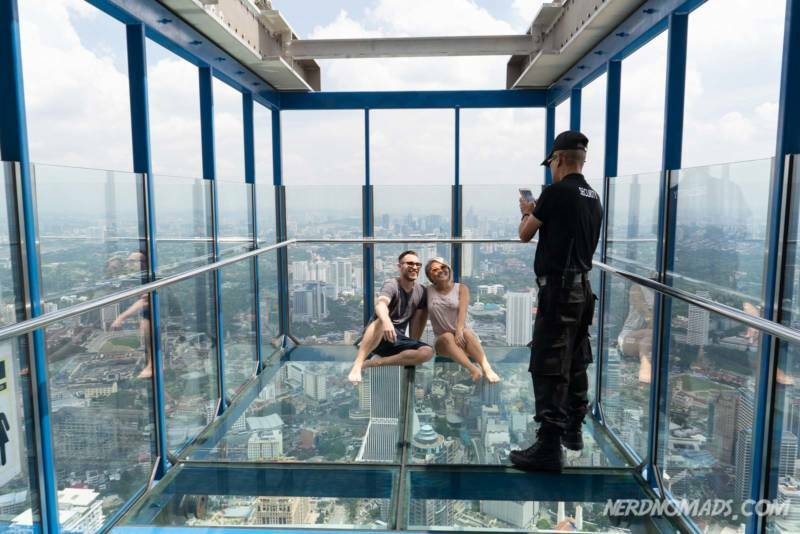 If you dare, you can go out into this box, and you get a panorama view and some breathtaking photos of the whole of KL city as there is nothing but see-through glass between you and the ground below. I have a bit fear of heights so I could feel the butterflies in my stomach and my legs became like jelly. There are guards at each Sky Box, making sure that everyone takes off their shoes and don´t bring bags into the box. They can also take photos of you. 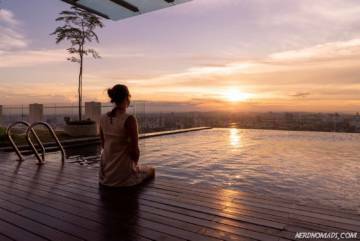 If the open-air Sky Deck is closed due to weather conditions, or you have no interest in going to the open-air deck due to for instance fear of heights (although you are missing out if you don´t go), you can opt for going only to the Observation Deck. 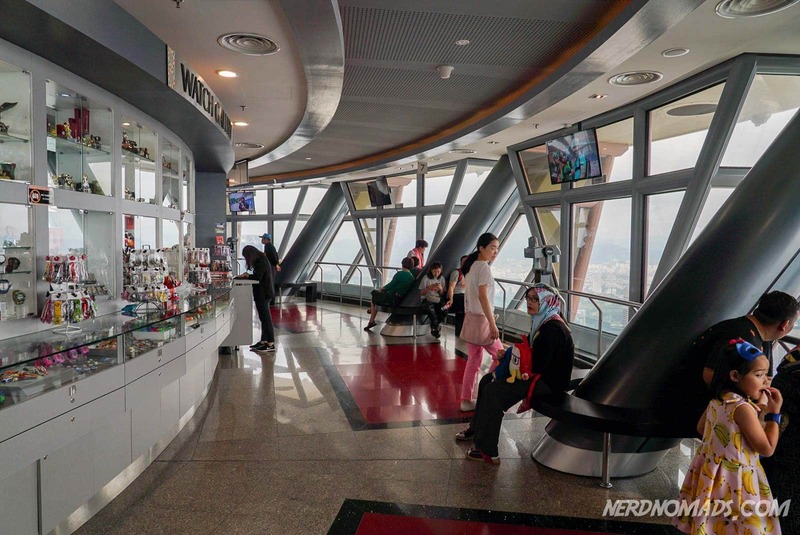 The Observation Deck is an indoor deck with huge glass windows, located at 276 m above ground in the KL Tower. It is not as cool as the Sky Deck, but you still get a great view of KL. Surrounding the KL Tower is a lovely green and lush rainforest called KL Forest Eco Park, previously known as the Bukit Nanas forest reserve. It is one of the oldest permanent rainforest reserves left in Malaysia. 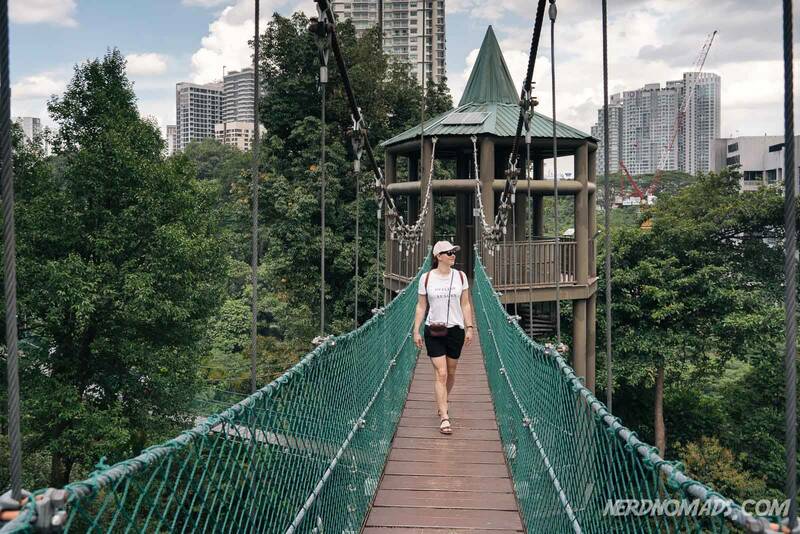 There are several beautiful and well-marked hiking trails through the KL ECO Forest Park, and one is a super cool canopy walkway. We love walking along this 200 m canopy walkway high up among the treetops. It feels like a little adventure and is the perfect place for photos. 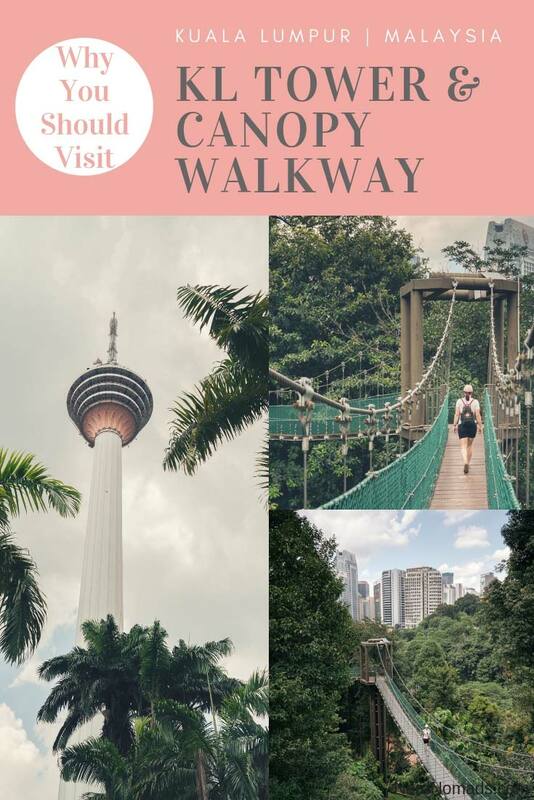 The canopy walkway is comfortable and sturdy and is quite broad allowing two people to meet and easily walk past each other. So no need to worry. The KL Forest Eco Park is an oasis in the middle of the hustle and bustle of the city, so peaceful and calming that you forget that you are in the center of a metropolitan city. It is great fun too, both for kids and adults. The forest is full of beautiful birds that might be difficult to see, but you can easily hear them singing beautifully. 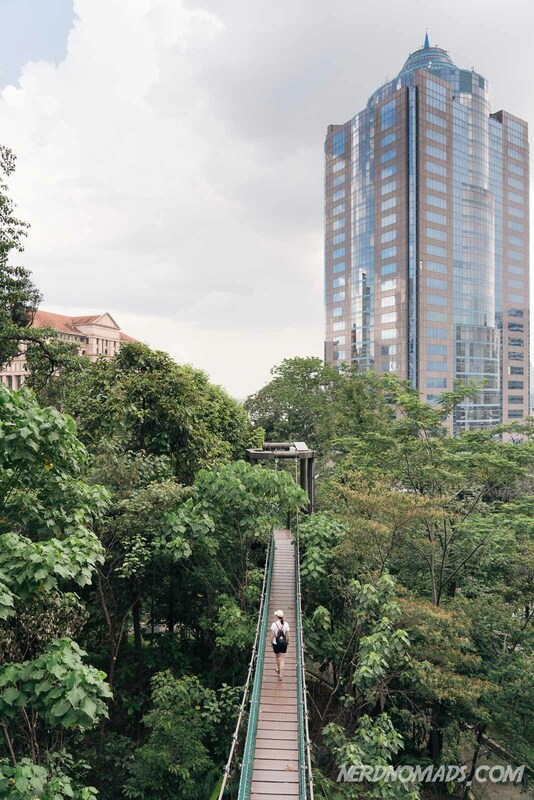 This canopy walkway must not be confused with the FRIM canopy walk located on the edge of the KL city. With FRIM canopy walk closed indefinitely, this canopy walkway in KL Forest Eco Park is now the only one open to the public. 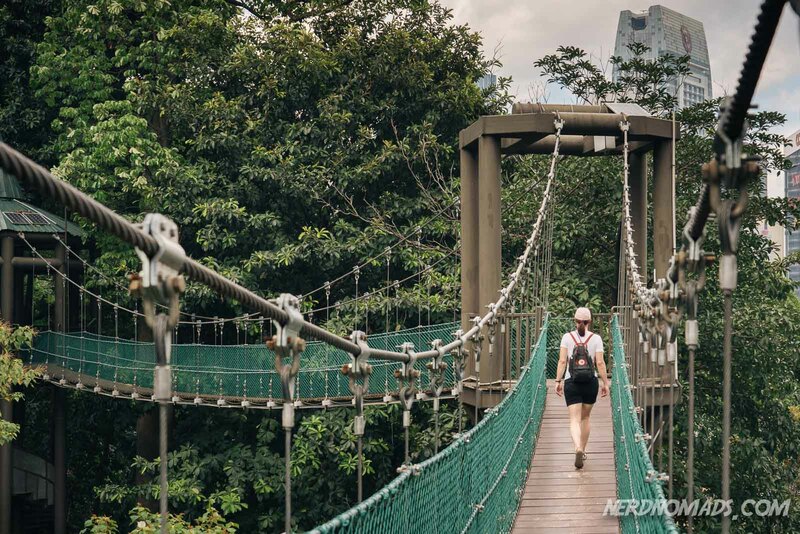 Wear good walking shoes or sandals, and remember to bring water, sunscreen, and mosquito repellent as there are no kiosk or cafe inside the KL Forest Eco Park. Enter the park from the KL Tower (by the parking lot). Ticket prices KL Forest Eco Park: FREE! 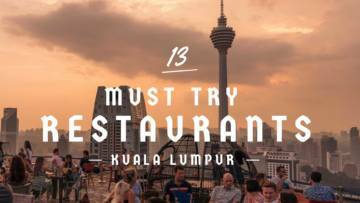 There are some restaurants, cafes, and a kiosk at the basement of the KL Tower, but for an extraordinary dinner, lunch, or afternoon tea experience you should head up to the cool Atmosphere 360 revolving restaurant. A dining experience with one of the most spectacular views you can ever have! They have an a la carte menu and buffets (lunch and dinner) where you can eat as much as you want for a fixed price. If you are not that hungry, you can head up there for drinks only. The restaurant has a dress-code (see their webpage). 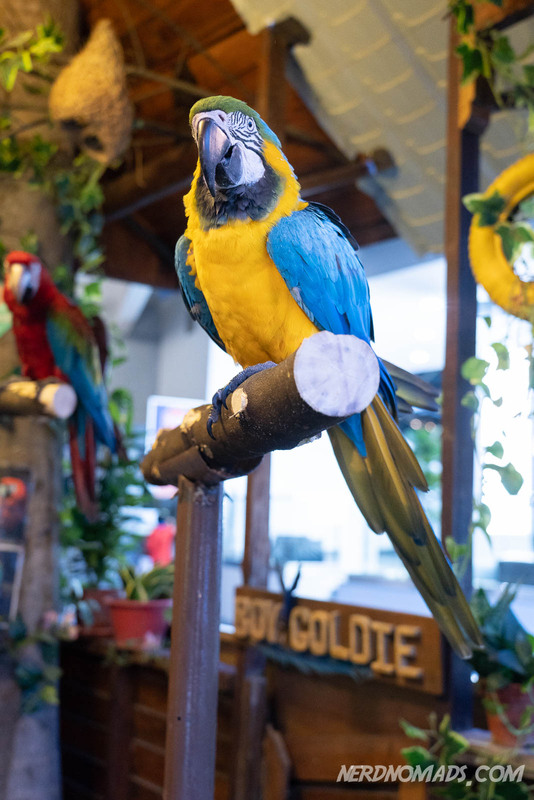 It is not nearly as big as the famous KL Bird Park, but the Mini Zoo located next to the basement of KL Tower has some exotic animals. Here you can meet massive pythons, cheeky squirrels, cute monkeys, colorful parrots, fluffy lamas, and cuddly rabbits. Great fun for the kids! The latest attraction at the KL Tower is the Upside Down House. 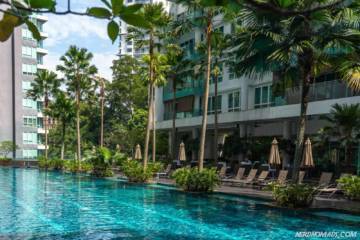 It is located right by the parking lot, across the road from the big I♥KL Tower statue. I must admit that it looks kind of funny as the whole 2-story house and its furniture is up-side-down, mounted in the roof! It put a smile on everyone’s faces. 🙂 There is an antique Morris 1974 car hung upside down at the entrance. So cool! A visit to the Upside Down House is a fun experience, especially for kids, and the perfect place for fun selfies to put on Instagram, Facebook, and Snapchat. 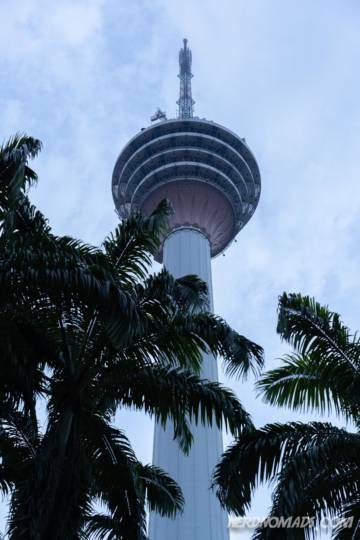 The KL Tower is one of the must-see-sights of Kuala Lumpur in our opinion. 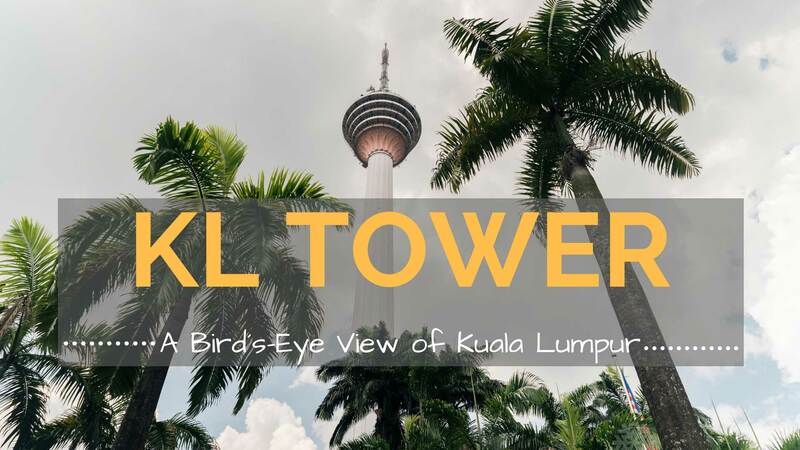 The open-air Sky Deck with its spectacular KL city view is the best part of the tower, but the Canopy Walkway in KL Forest Eco Park is also great fun and something that you should not miss if you head to KL Tower. 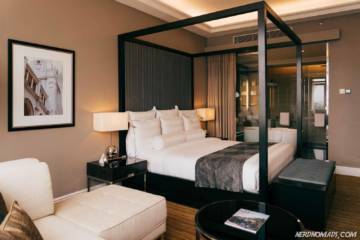 Build in 1932 as Kuala Lumpur’s first luxury hotel, The Majestic has been host to royals and celebrities. A massive restoration project finished in 2012, and today it perfectly mixes old world luxury with modern five-star comforts. First of all: great blog. I am personally an expat that is working with IT in China, which I have done for two years already. I can absolutely relate to your story. 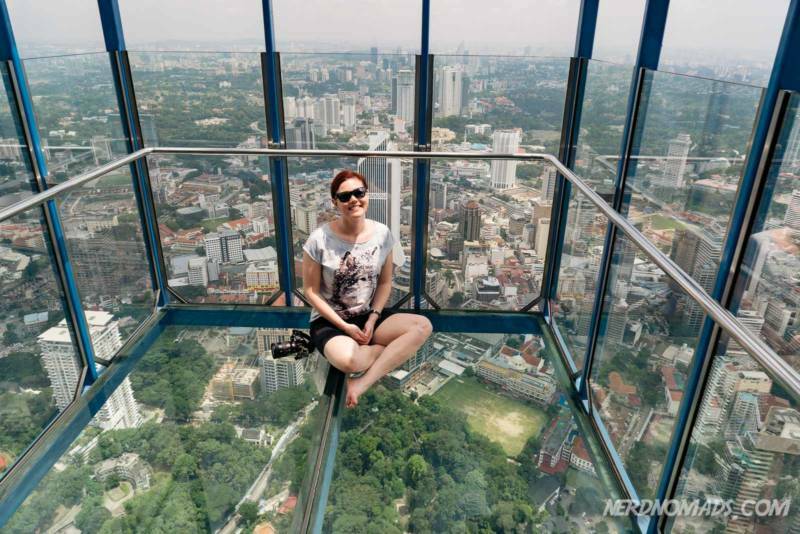 About the glass ceiling: experienced something similar in The Pearl Tower in Shanghai. 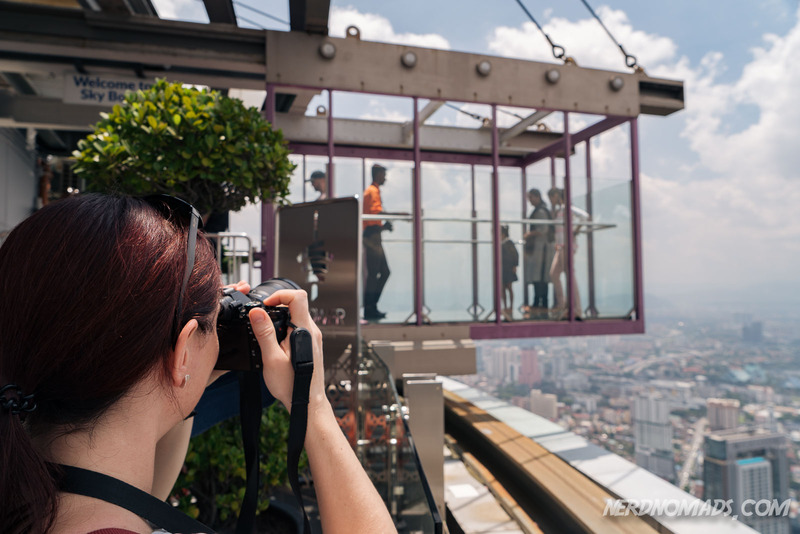 Walking on a glass floor about 300 meters above ground is not something for me….sweaty hands. Thank you so much for your nice words about our blog! Really appreciate it! 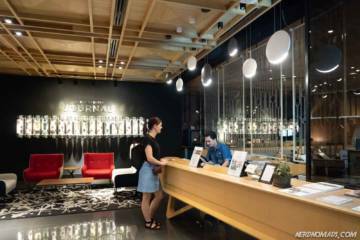 The Pearl Tower in Shanghai sounds awesome! Have unfortunately not been to Shanghai yet, but would love to one day! Have heard that it is very modern and posh? And a bit different from the rest of China? WooW, very useful information, thanks a lot, I will travel to Malaysia soon! Thank you so much, Bahar! Have a great trip to Malaysia! Go KL City Bus: The Go KL City Bus – Purple Line will stop at a bus stop near KL Tower. RapidKL LRT – The No. 5 pink LRT Kelana Jaya line: Take the LRT and stop at the Dang Wangi station. 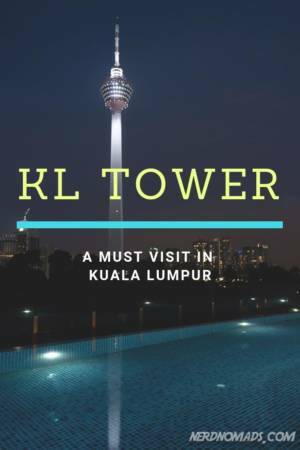 KL Tower is just few minutes walk from the Dang Wangi LRT station. KL Monorail: Take the KL Monorail and stop at the Bukit Nanas monorail Station. 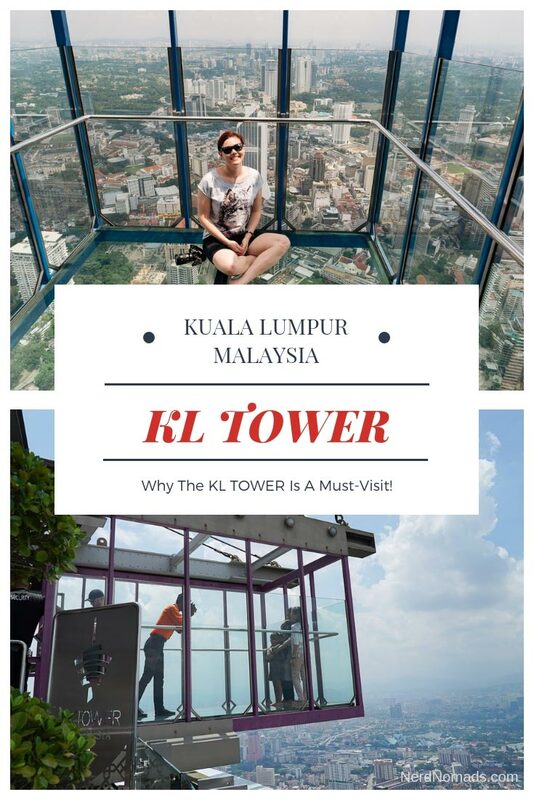 The KL Tower is just some minutes walk from Bukit Nanas. 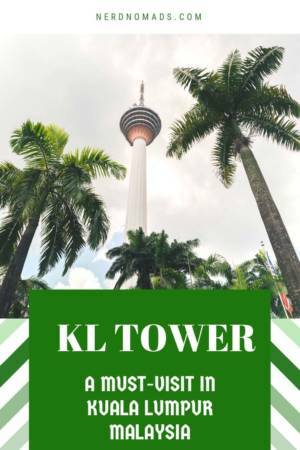 A free shuttle bus runs from the gate to KL Tower on Jln Punchak, or you can walk up the hill to the base of the KL Tower.